This blog is the second in a series highlighting the 5 Early Benefits of FirstNet for public safety. FirstNet is the nationwide public safety communications platform dedicated to America’s first responders. Created through a partnership with the First Responder Network Authority and AT&T, FirstNet is a much-needed technology upgrade to connect public safety to the vital information they need—every day, in every emergency. FirstNet is now available across the nation, with first responders (such as fire, law enforcement, emergency medical services, and emergency managers) guaranteed priority and preemption over a secure, robust network dedicated to them. Priority and preemption allow first responders to communicate without interruption over an “always-on” network. Public safety entities using FirstNet can also boost priority levels in emergencies, keeping their first responder teams connected when lives depend on it. 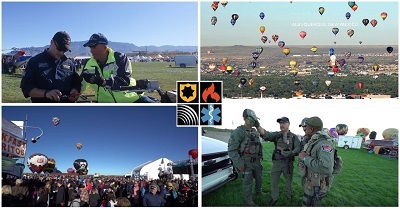 Priority and preemption are a few of the crucial features FirstNet provides to first responders, especially during large planned events with thousands of participants, such as the annual International Balloon Festival in Albuquerque. In years past, first responders at the festival reported poor connectivity on commercial networks due to attendees’ high volume of voice calls, texts, and social media posts. But using FirstNet, public safety’s dedicated network, for this year’s festival, they had a dramatically different—and better—experience. Reunite families – A picture is worth a thousand words, and with priority and preemption, public safety officials at the International Balloon Festival were able to quickly reunite lost children with their families because they could share photos with other public safety on the ground. “Given so many people using their phones, [commercial networks] get overwhelmed with the amount of traffic. Everybody's sending a picture, everybody’s texting, everybody’s streaming live. This little device was connected to the FirstNet network, so it was invaluable,” said Arthur J. Martinez, Captain of Special Operations, City of Albuquerque Fire Department. Get real-time updates – When severe weather threatened the 2018 Volvo Ocean Race in Newport, RI, the emergency management team used FirstNet to brief event personnel on the weather risks to the crowd and potential evacuation plans. Incident command shared radar maps with ground personnel and had evacuation maps ready to share digitally across FirstNet devices in the case of severe weather. Improve situational awareness – City of Richmond public safety officials experienced FirstNet’s speed and priority first-hand by using it to receive live camera and weather feeds for monitoring, pull up suspect information to aid in crime solving, or tie computer-aided dispatch (CAD) interfaces to 911 call centers. For Richmond, public safety’s network proved it could handle emergencies, large-scale events, and everything in between. For more information on FirstNet products and services, visit FirstNet.com. To learn more about the First Responder Network Authority’s public safety advocacy and innovation, visit FirstNet.gov and sign up for our newsletters here.